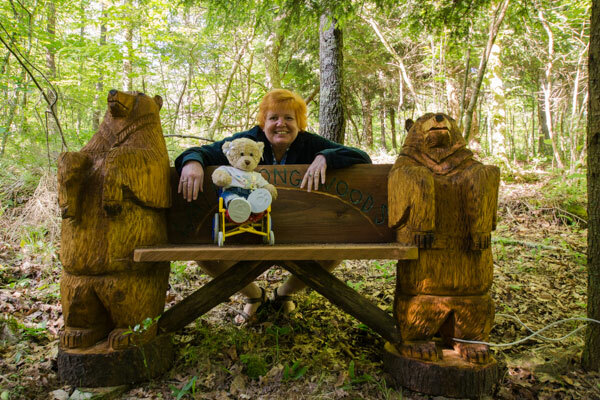 There's even a special bear bench for Cherrie near the cabin! Every time I visit Ohio’s Hocking Hills I discover a new cool accessible lodging option—and this time was no exception. Last night we stayed in a very accessible creekside cabin near Logan, Ohio. It was compact, but still had room enough for a wheelchair, and it included a small kitchen and a lovely back deck. There was also a private hot tub on the deck, but it wasn’t accessible. The bathroom was well done, with a roll-in shower, a roll-under sink and an alcove toilet with grab bars on both sides. They even used an extra wide 41-inch door on the bathroom. But the best thing about it was that it was very private. The owners left the keys under the mat, and nobody disturbed us. It’s the perfect property to include in my next book – “Resting Easy in the US; Unique Lodging Options for Wheelers and Slow Walkers” (coming next spring!). I’m always excited when I score another book property. And it’s also a short drive away from Ash Cave, which boasts a nice paved quarter-mile trail that winds along the river. It’s a great place for a picnic, or to just stop and enjoy the scenery. I just love the Hocking Hills. This entry was posted in Lodging, Road Trips, Traveling Cherrie and tagged accessible, barrier-free, cabin, disabled travel, Hocking Hills, Ohio, slow walker, wheelchair by Candy B. Harrington. Bookmark the permalink.